Antique and second-hand frames for sale: over 800 frames are in stock. Manufacture of new gilded frames in 18th and 19th century styles from our stock of mouldings, unique to us. Copy carved wood frames from your originals. Restoration and repair of frames, including re-carving. Cutting down frames and providing a wide range of slips. A full restoration service for oil paintings, including lining and re-lining. Cleaning, pressing and retouching watercolours and prints. Handmade conservation mounts in all styles. Washlines, gilded mounts, spandrels and vere eglomise. Fitting up pictures, including mirrors, conservation glass and/or spacers. We are happy to offer advice on all aspects of framing, restoration and hanging of pictures and other objects. 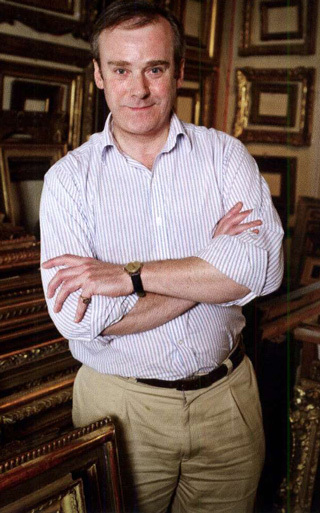 Expert impartial advice given on the condition and likely cost of restoring pictures or frames offered for auction. Free estimates given on pieces brought to our gallery. We have over 20 years experience and the vast majority of the services are carried out "in house".